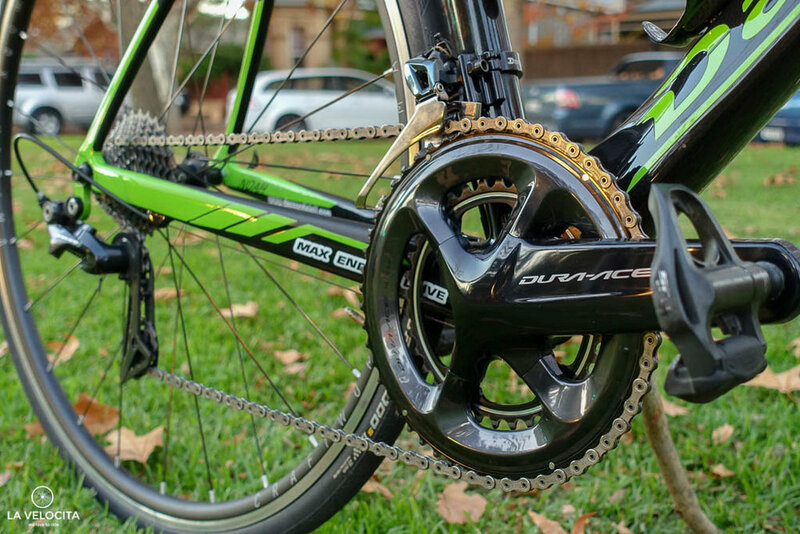 Daccordi Noah review - LA VELOCITA. I’m unusually well-versed in Italianness for someone indifferent to bike nationality. My own bike collection includes 2 handmade Italian bikes. The first, my 2013 Bottecchia Emme 2, and my steel 1995 Daccordi Furioso that I got second hand for a few hundred buckeroos because it’s really really pink. In my experience yes, Italian bikes definitely have a distinctive character. I was rather excited when Adelaide’s Norwood Parade Cycles asked if I wanted to ride a spankin' new Daccordi Noah for a few days. They’re the Australian distributor and only stockist of the Italian marque - one that few have heard of but one with barrels of heritage. Daccordi is one of the most Italian of all the Italian bike makers, quite possibly the most Italian bike brand (COME AT ME COLNAGO/PINNARELLO/BIANCHI FANBOYS!). Founded in 1937, their frames are all handmade and painted in Italy by the Daccordi family. Yup, it's an Italian family business. Their website is 95% in Italian with a few scattered English words, and there’s very few reviews of their bikes anywhere. They just seem too busy making frames to do the marketing malarky. So you’re damn right I was excited to ride one! I can do it with a mind unclouded having seen no more than a couple of them in the world. The Noah is a classic racing frame. It’s a full high-mod-high-resistance carbon fibre with a 3k external tissue of carbon for the finish to attach to. It uses full carbon dropouts, monocoque carbon fork, integrated headset, press fit BB, and a refreshingly round seatpost clamp. 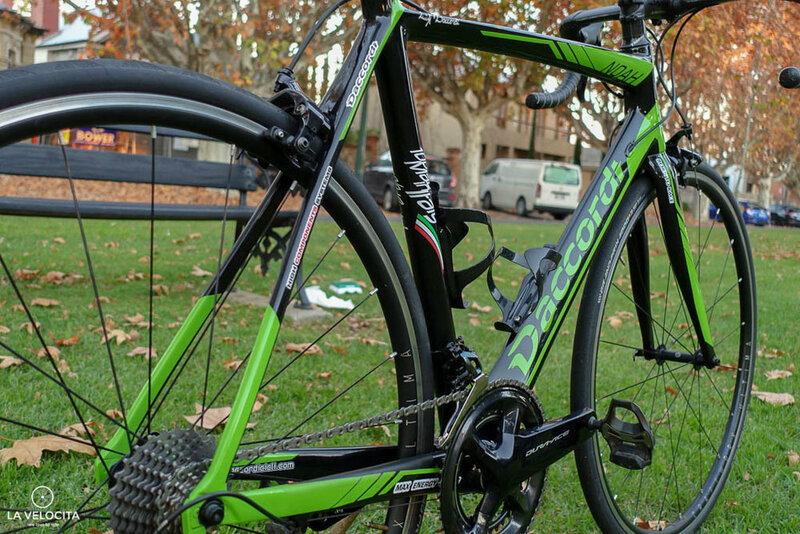 Daccordi have used an impossibly clean tube-to-tube construction to put it all together. The tubing is an interesting mix of shapes; the seat tube is round, but the down tube is a huge triangular prism with a rounded underbelly. Top tube is another triangular prism that starts thick at the head tube and tapers until the seat tube join. Up front, the head tube is a classic 1”1/8 that drops into the massively bulbous carbon forks. The frame reviewed had internal cabling but Daccordi can build Noahs to fit Di2 or EPS by request. Geometry is, again, classic racing frame. The short chainstays, 73.3° angles, short head tube, and almost square geometry belong in the peloton. Retail price from Norwood Parade Cycles is $5,500 AUD - which stands out as quite good value for handmade Italian frames from brick-and-mortar. You can even customise a Noah frame by consultation with Daccordi. There’s plenty of cosmetic options including custom paint and decals, choices of cable routing, and even some geometry tweaks if you’d like small adjustments to tube lengths or some angles. There's options for aero seat tubes, and integrated seat posts too if those things float your boat. Italian Race bikes of the Noah’s ilk really are a breed of their own. As soon as you turn a pedal it’s obvious this bike exists to go very, very fast. There’s absolutely nothing that indicates compliance and yet it’s a very smooth ride. Classic Italian race frames walk this line impressively well; stiff enough to be fast and exciting but smooth enough not to beat you up. Its stiff front end does communicate road feel into your hands. That’s not a bad thing necessarily because a racing frame should do that. If anything it’s impressive that the front end isn’t harsher after inspecting the massive fork. Nonetheless, it’s not a plushy cloud that isolates you from road texture. The rear of the bike continues the stiffness. The enormous bottom bracket converts your effort into forward velocity as willingly as any other racing frame I’ve ridden. Like the front, there’s not a lot of compliance through the rear. There’s some lateral flex in the carbon post but the almost-squared geometry means little of it pokes out. 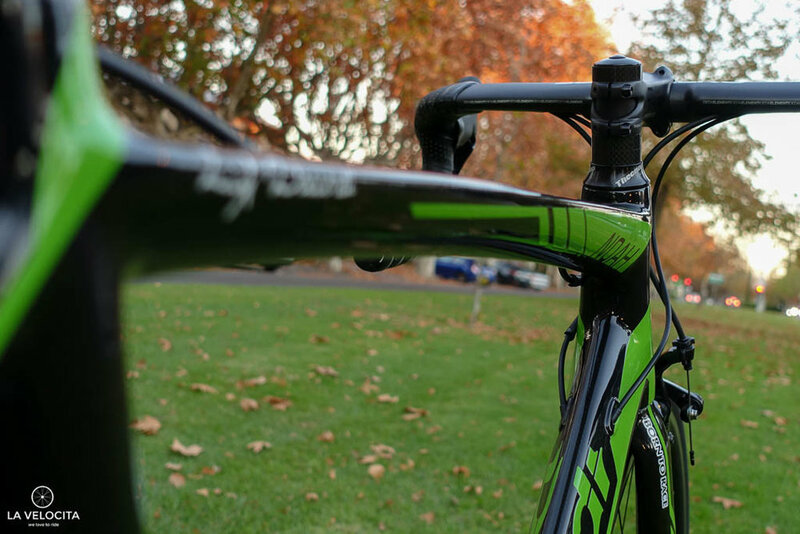 It’s a far cry from dropped and pencil-thin seat stays and narrow seatposts becoming ubiquitous around the industry. Even aero bikes are using kammtail seatposts to soften up their rear end. Again, the Daccordi manages the stiffness-smoothness balance admirably. Front-to-back the Noah feels like it wants to go fast. The handling and superb balance make the frame ultra-responsive to ride. All of your movements and shifts in weight have an effect on the bike. It's always willing to help you go fast. The only trade-off for that speed is some plushness. Reviewed spec included 25mm tyres on 23mm-wide rims that I ran at my preferred 70psi. Though it softened the bike a bit, you can’t escape the racing firmness. This isn’t a criticism, more a warning for prospective buyers that this is a racing frame. It ain’t a Gaint Defy or Specialized Roubaix. A great test of a road bike’s handling is how responsive it is to leaning rather than steering input to get around corners. The Noah requires a bafflingly low amount of steering to send it 'round the bend, easily the least of any frame I’ve ridden to date. For lack of a better phrase, you just tip it in! Daccordi have absolutely nailed the geometry. Threading the Noah through corners is quite an experience. The front end is just so stiff. There’s swathes of bikes with thin and flexy forks, stems, or handlebars designed to take the sting out of the road, and absorb bumps. There’s none of that with the Daccordi. The fork is massive; both bulbous and thick down to the quick release. I can’t recall the last time I saw a fork quite like it. That beefy front end helps with the wonderful handling. All that stiffness makes the Daccordi ridiculously responsive. It’s not twitchy as such, like the Specialized Allez is twitchy, but it’s highly reactive to small steering inputs. As mentioned above, many corners are dispatched with a lean. I took a few corners to adjust to that feeling but it was brilliant once I did. The bike feels exactly the same at corner entry, mid-corner, and corner exit. It doesn’t need you to actively steer or saw away at the bars. It’s totally rock solid. Pick a line and the bike will stick to it. The front end is complemented by the rear of the bike. A little bit of hip steering keeps the bike tracking beautifully. It’s got a broadly similar bottom bracket drop and wheelbase to other racing frames so it will befamiliar to anyone used to that feeling of really flogging a fast bike. I have no doubt the Noah will handle your road race, lumpy kermesse, or uphill TT with ease. Front-to-back it’s a superb handling frame. Riding the Noah is a joyful experience. It’s stiff, sprightly, with incredible handling, and impressive smoothness. Truly a race rocket that takes the best from the good ‘ole days and makes it with the best modern carbon fibre working. A beautiful melding of old and new. It was damn refreshing to ride the Daccordi Noah at a time with an ever-turning technology treadmill and obsession with squeezing every margin possible. It’s a bike with nothing proprietary, pure racing geometry, nothing aerodynamic, a round seatpost, and no particular homages to modern road bike trends. There are plenty who yearn for the simplicity and purity of frames like the Noah. It carries so much heritage and tradition, something that cannot be underestimated in a globalised and cut-throat bike industry. Daccordi doesn't carry the same gravitas as Italian giants like Bianchi, Pinnarello, or Colnago but they're every bit as Italian. Daccordi was one of the brands that faded from the Grand Tours when manufacturers started paying teams to ride their frames rather than the other way around. It's a $5,500 handmade Italian racing frame. That'll either appeal to you or not. Anyone who takes the plunge on this heritage Italian frame maker will get exactly what they paid for; a damn good frame for a pretty penny. HOW TO BUY - Norwood Parade Cycles are the Australian stockist and Importer for Daccordi and can talk to you about buying one. This was not a paid review and we don't get any benefits from Daccordi sales. Our door is always open to riding awesome bikes!